Activated microglia in the brain. [Image: Zeiss under a CC BY-NC-ND 2.0 license.]. Despite probing and prodding microglia every way they can think of, scientists are still unsure whether these cells help or hinder neurodegeneration. Now, mice whose neurons express a truncated form of the ALS-related protein TDP-43 reveal a microglial state that helps neurons heal. Researchers led by Virginia Lee, University of Pennsylvania, Philadelphia, report that microglia appear surprisingly unreactive as TDP-43 accumulates in the animals’ spinal cords. However, turning off TDP-43 expression seemed to awaken the cells. They proliferated, gobbled up TDP-43 aggregates, and motor function improved. 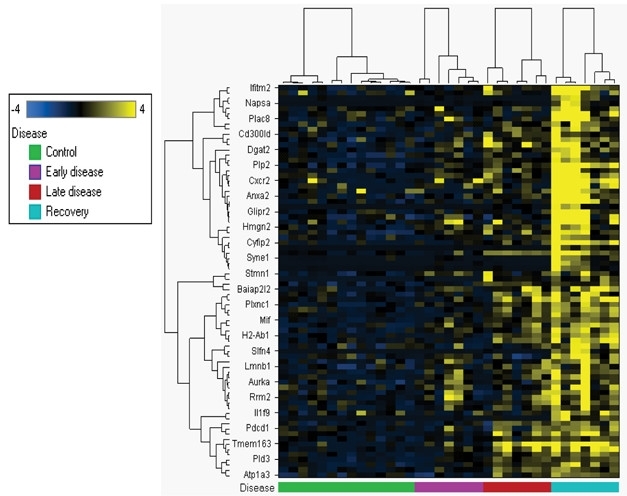 In their activated state, the microglia expressed a unique set of genes, distinct from the set expressed during disease progression. The findings are reported in the February 20 Nature Neuroscience. “This is a very elegant model,” said Stanley Appel, Houston Methodist Neurological Institute, Texas. Oleg Butovsky, Brigham and Women’s Hospital in Boston, said the study was extremely important, given the dearth of information on ALS disease mechanisms, but cautioned it has limitations. Studies have long implicated microglial activation in amyotrophic lateral sclerosis (ALS) pathology (e.g., Engelhardt and Appel, 1990; Turner et al., 2004; Corcia et al., 2012), as well as in the superoxide dismutase 1 (mSOD1) mouse model of familial ALS (Alexianu et al., 2001; Hall et al., 1998). Blocking microglial proliferation or function slows disease progression and reduces motor neuron loss in mSOD1 mice (Martínez-Muriana et al., 2016; Frakes et al., 2014). However, microglia have also been reported to be neuroprotective in the early stages of disease (Liao et al., 2012; Hooten et al., 2015). Hoping to clarify the different roles microglia can play, first author Krista Spiller used a conditional TDP-43 model created in Lee’s lab (Nov 2015 news). The rNLS8 mouse expresses human TDP-43 in neurons but without its nuclear localization signal. The model mimics pathology seen in more than 90 percent of ALS patients and in some patients with frontotemporal degeneration, namely, the accumulation of TDP-43 aggregates in the cytoplasm. A neurofilament heavy chain promoter, which can be blocked with doxycycline, drives expression of the transgene. Lee explained that this mouse model enables her to study neurodegeneration separately from recovery; the former happens while the hTDP-43 gene is turned on, the latter after the transgene is turned off and pathology subsides. 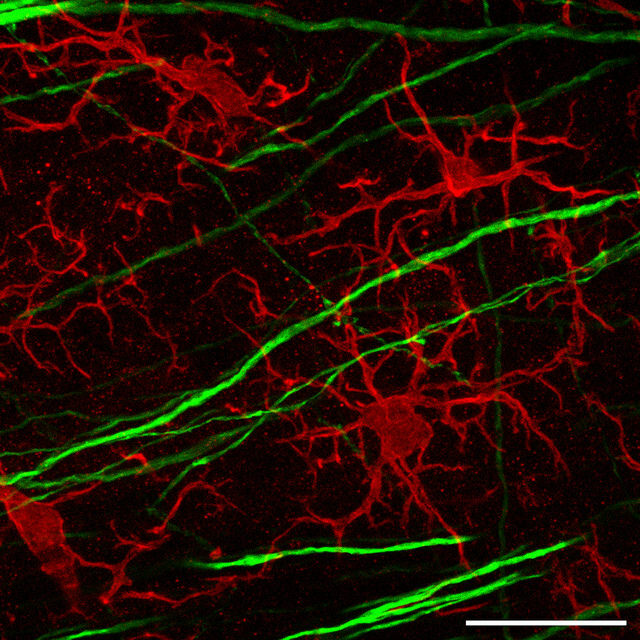 “It has been really hard to separate favorable microglia effects from unfavorable ones. Here we can at least separate the damage stage from the healing stage,” said Spiller. Raised on a doxycycline-laced diet, the rNLS8 mice led healthy lives until they were switched to doxycycline-free chow, usually at three months of age. Consistent with the group’s previous findings, two weeks after the switch hTDP-43 aggregates began showing up in the lumbar spinal cord. Also at this time motor symptoms began to surface: The mice clasped their hind limbs abnormally when suspended by their tails, trembled, developed an arched back, and scored poorly on grip strength, motor coordination, and balance. Surprisingly, Spiller found no change in microglial number, shape, or in the expression of the microglial activation marker CD68 compared with controls that remained on doxycycline. Even six weeks after turning on the transgene, when about 30 percent of lumbar motor neurons had died off, Spiller saw slightly more microglia, but still no change in their shape or CD68 expression. “I was really surprised,” she said. “I thought maybe it was just one or two weird animals.” However, the findings held across five animals each at zero, two, and six weeks after inducing hTDP-43 expression. To test what happened after the hTDP-43 spigot closed again, the scientists added doxycycline back to the chow when the mice were about 20 weeks old and had been expressing hTDP-43 for six weeks. Within a week, microglia in the spinal cord doubled in number (image above), with many adopting an amoeboid shape typical of reactive microglia. The researchers saw a similar transformation when TDP-43 had been on for only two weeks and motor neuron loss was minimal, suggesting the response is independent of cell death. Also, the fraction of microglia that had taken up hTDP-43, presumably by phagocytosis, shot up from about 10 percent to nearly half after a weeklong hTDP-43 holiday. Interestingly, only rarely did the researchers spot other neuron-specific proteins, such as the neuronal nuclear antigen NeuN and choline acetyl transferase, within microglia, suggesting the cells selectively cleared hTDP-43. 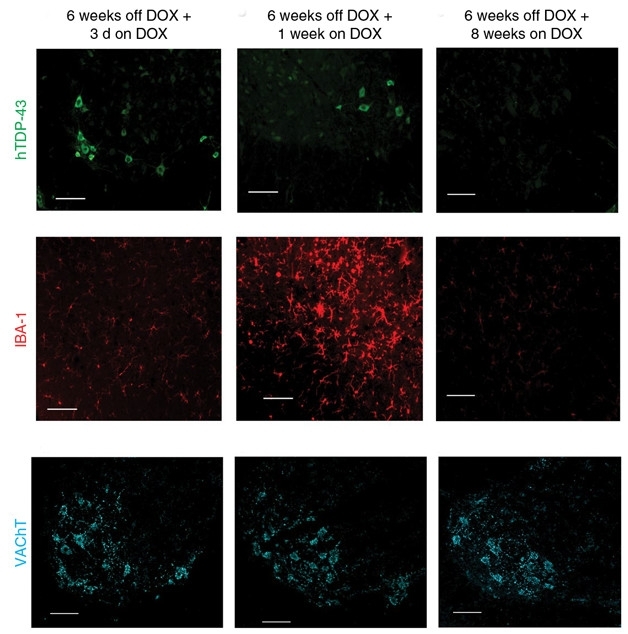 To probe molecular differences between the microglial phenotypes, the authors analyzed transcriptional profiles two and six weeks after turning on hTDP-43, as well as one week after switching it off, a time the researchers call “recovery.” In the late stage of TDP-43 pathology, i.e., after six weeks of hTDP-43 expression, many of the upregulated genes matched those in a microglial neurodegenerative phenotype (MGnD) and in disease-associated microglia (DAMs), as reported previously (Sept 2017 news; Krasemann et al., 2017; Keren-Shaul et al., 2017; Tay et al., 2017). Interestingly, these genes remained highly expressed during recovery. A separate group of genes were specific to recovery, including genes coding for cell adhesion molecules and phagosome proteins (image below). To test the effect of removing microglia during the recovery stage, the researchers fed mice PLX3397, a compound that blocks the kinase activity of colony-stimulating factor 1 receptor and is known to selectively kill microglia. Spiller started giving PLX3397 a week before turning off hTDP-43 and continued for another two weeks after. Whereas PLX3397-free mice were essentially symptom-free at the end of the intervention, PLX3397-treated mice still clasped their hind limbs and some remained hunched over. Muscle action potentials, motor neuron numbers, muscle denervation, and hTDP-43 levels all correlated with the extent of microglial depletion, with lower numbers of microglia linked to poorer signs of recovery. Why do microglia swing into action only after hTDP-43 is switched off? “That’s the million-dollar question,” said Spiller. At first she thought hTDP-43 expression was making the microglia sick, but when she challenged them with lipopolysaccharide or injured a nerve, the microglia responded normally. “Maybe they are lacking a signal,” said Spiller, who is now testing candidate regulators in vivo. Butovsky said understanding the rNLS8 model better was an important next step. He and Cooper-Knock were both puzzled by the lack of microgliosis during hTDP-43 expression. “Microglia are the sensors of the brain and usually respond to very small changes. How can they not be responding to this massive neuronal loss? This is completely unexpected,” Butovsky said. He also found it odd that no astrocytosis accompanied the recovery microgliosis, and that these microglia continued to express homeostatic genes. For his part, Appel wondered if other immune cells, such as regulatory T lymphocytes and astrocytes, collaborate with microglia in this model during both the disease and recovery stages (Henkel et al., 2013). Spiller KJ, Restrepo CR, Khan T, Dominique MA, Fang TC, Canter RG, Roberts CJ, Miller KR, Ransohoff RM, Trojanowski JQ, Lee VM. Microglia-mediated recovery from ALS-relevant motor neuron degeneration in a mouse model of TDP-43 proteinopathy. Nat Neurosci. 2018 Feb 20; PubMed. Engelhardt JI, Appel SH. IgG reactivity in the spinal cord and motor cortex in amyotrophic lateral sclerosis. Arch Neurol. 1990 Nov;47(11):1210-6. PubMed. Hall ED, Oostveen JA, Gurney ME. Relationship of microglial and astrocytic activation to disease onset and progression in a transgenic model of familial ALS. Glia. 1998 Jul;23(3):249-56. PubMed. Martínez-Muriana A, Mancuso R, Francos-Quijorna I, Olmos-Alonso A, Osta R, Perry VH, Navarro X, Gomez-Nicola D, López-Vales R. CSF1R blockade slows the progression of amyotrophic lateral sclerosis by reducing microgliosis and invasion of macrophages into peripheral nerves. Sci Rep. 2016 May 13;6:25663. PubMed. Frakes AE, Ferraiuolo L, Haidet-Phillips AM, Schmelzer L, Braun L, Miranda CJ, Ladner KJ, Bevan AK, Foust KD, Godbout JP, Popovich PG, Guttridge DC, Kaspar BK. Microglia induce motor neuron death via the classical NF-κB pathway in amyotrophic lateral sclerosis. Neuron. 2014 Mar 5;81(5):1009-23. PubMed. Liao B, Zhao W, Beers DR, Henkel JS, Appel SH. Transformation from a neuroprotective to a neurotoxic microglial phenotype in a mouse model of ALS. Exp Neurol. 2012 Sep;237(1):147-52. PubMed. Hooten KG, Beers DR, Zhao W, Appel SH. Protective and Toxic Neuroinflammation in Amyotrophic Lateral Sclerosis. Neurotherapeutics. 2015 Apr;12(2):364-75. PubMed. Henkel JS, Beers DR, Wen S, Rivera AL, Toennis KM, Appel JE, Zhao W, Moore DH, Powell SZ, Appel SH. Regulatory T-lymphocytes mediate amyotrophic lateral sclerosis progression and survival. EMBO Mol Med. 2013 Jan;5(1):64-79. PubMed.